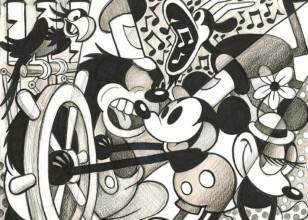 Peg Leg Pete has known Mickey since Steamboat Willie. 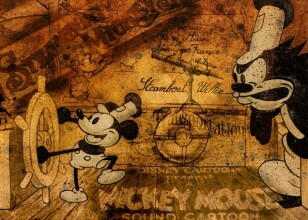 Since then he has done nothing but pester and attempt to outdo Mickey. Interestingly, Pete himself predates Mickey by almost three years, he made his debut in Disney's Alice Comedies series. He first appeared in "Alice Solves The Puzzle" as "Bootleg Pete" a bear-like creature who was a collector of crossword puzzle and tries to steal a rare and valuable one from Alice. 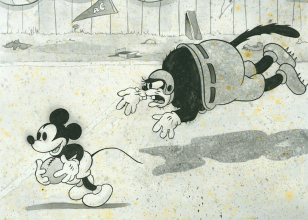 Also before Steamboat Willie, he was an enemy of Oswald the Lucky Rabbit, often competing with him for the love of Sadie, or as she is known today, Ortensia in cartoons like "Oh, What a Knight." 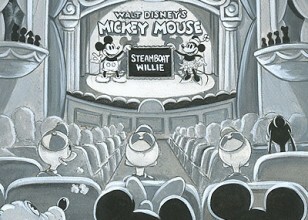 In the first cartoon with sound Steamboat Willie Pete and Mickey made their first and third appearance. Pete was captain of the steam boat and would never give Mickey a break. 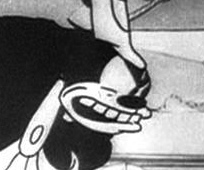 From beating Mickey on the head to bashing him into the ground Pete has done anything that he could do to hurt him taking enjoyment with every swing. Back then, Pete was considered more of a jerk and a bully than the villain he is known as today.